A local advocacy group that helps people leave the gang life has released the second phase of its gang prevention report. STR8 UP consulted with more than 60 communities across Saskatchewan to create a provincial gang strategy. It is focused on prevention and intervention. “They don’t want the push from the police to be taking the lead,” said lead researcher Robert Henry, an assistant professor of sociology at the University of Calgary. The report outlines several recommendations, including helping communities better understand gangs, increasing access to mental health and addictions supports, and funding for more affordable sober living spaces. “There’s individuals that are contacting me — parents that want their child to leave — and if we don’t have the resources, how are we supposed to support them,” said STR8 UP president Stan Tuinukuafe. 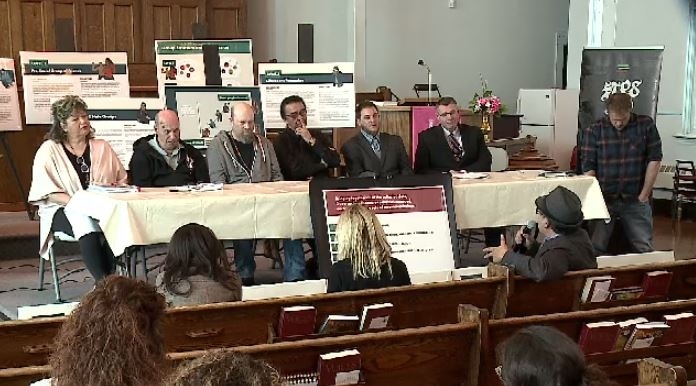 The organization said nearly 700 people across the province weighed in through surveys, a provincial gang strategy forum last May in Saskatoon, and nine community consultations that took place between November and March. Communities would like see regional offices placed around the province, but that would require more funding, Tuinukuafe said. “We can have all the recommendations in the world out here and what the communities want but if there’s actually no financial backbone or commitment from the government to move these communities forward, it’s just going to sit as a report,” said Henry. Shane Partridge is an ex-gang member that helped steer the provincial strategy. “If there was a strategy like this in place when I was first trying to get out of trouble, I would have reached help the first time around,” he said. Partridge struggled with addictions and mental health issues, and eventually joined a gang. “What led me to that was no different than any of these other kids,” he said. He would like to see the strategy funded and implemented as soon as possible, to get much-needed supports into communities. STR8 UP consulted with more than 60 communities across Saskatchewan to create a provincial gang strategy.